Already holding the largest share of the UK smartphone market, Samsung believes that its latest smartphones running its Bada mobile operating system stands a good chance of rivalling sales of its Windows Phone handsets in the region as it continues to evolve its in-house software and expand beyond the Android plaform. According to a recent study by research firm GfK, Samsung now holds 32.6% of the UK smartphone market, currently only 53%of consumers own a smartphone device. The Korean mobile giant believes that as the market shifts and smartphone ownership increases to 79% in 2012, Bada – lead by the Samsung Wave III – will not only grow to rival sales of its other smartphone ranges, it stands a chance of matching, if not beating, sales of Samsung’s Windows Phone-powered smartphones. The projection was delivered by Keith O’Brien, Head of Content of Samsung’s Mobile Division, at the company’s second London Bada Developer day, which welcomes app developers and mobile designers to try out the new Samsung Wave III device and understand the value of the new Bada 2.0 operating system. 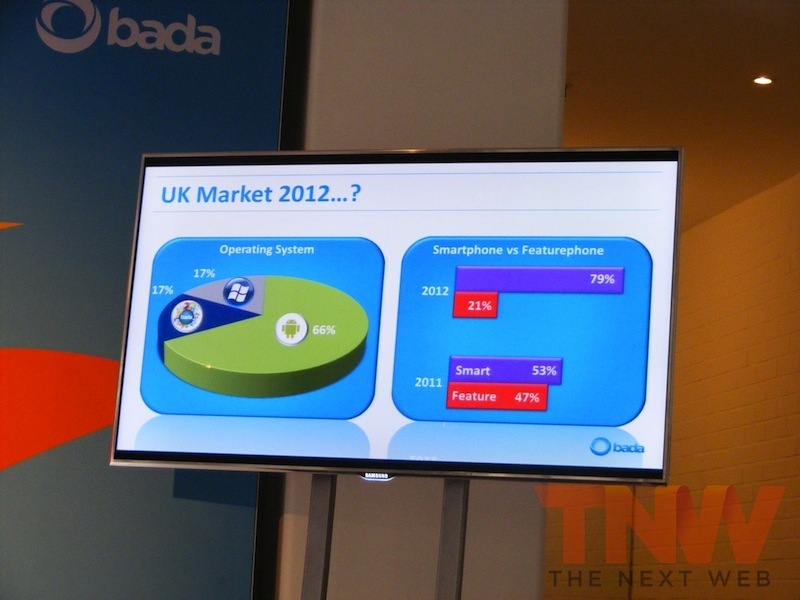 O’Brien also provided some statistics on how well the Bada platform has performed since its release in March, highlighting sales of Bada-powered smartphones have now surpassed 8 million units worldwide (300,000 in the UK), the Bada marketplace now has more than 13,000 apps which have been downloaded more than 110 million times (5 million in the UK) and that on average a Bada app is downloaded every 7 seconds. The Samsung Wave III is due to hit UK retailers later this year, bringing with it a 4.0-inch AMOLED screen, 1.4GHz single-core processor, NFC support and the new Bada 2.0 operating system with its ChatOn integration, Samsung Apps and TouchWiz 4.0 UI.